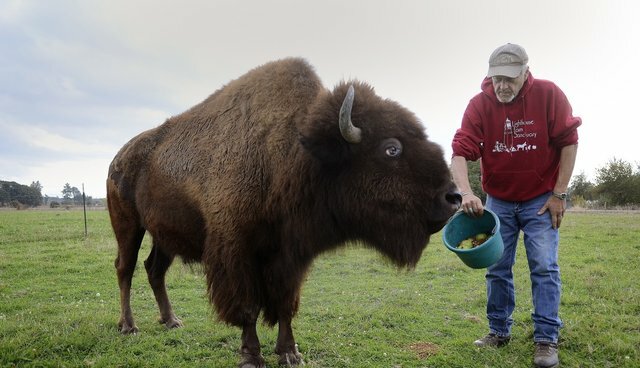 Today I was humbled by an opportunity to meet Helen, the blind plains bison at her new home at the Lighthouse Farm Animal Sanctuary southeast of Salem, Oregon. The 14 year old ruminant was as spunky and alert as could be. Accompanied by the Sanctuary's director Wayne Geiger, I approached Helen who was standing under a shelter in her two acre paddock chewing her cud after feeding on some hay. Wayne placed some treats in a feeding trough and she eagerly consumed them. It was hard to tell that she was at all visually compromised, but the bovid has been blind since birth, presumably due to a congenital anomaly. Bison cows can live approximately 20 to 25 years and although Helen was not quite up there in age, she is no spring chicken. It was heartening to see how well she had recently transitioned from the only home she knew to the Sanctuary. Due to unforeseen circumstances, her former owner had to relinquish her and had campaigned on social media outlets in search of a new home for the gigantic ruminant. Bison are the largest land animals in the Western Hemisphere and they are not so easy to keep. From what I could see and from what Wayne told me, Helen was truly a gentle giant. Bison are American icons. They are as majestic as they are gigantic. They once roamed the grasslands of our country's interior until they were hunted to near-extinction in the late 1800s. It is touching to see how we have learned to have compassion for something that was once the subject of industrial-scale hunting. There are now approximately 500,000 American bison (wood and plains spp.) in North America. Hopefully we can continue to cherish these ecologically important herd animals. Helen reminded me that every bison has a distinct personality and although we intensively manage bison herds today, there is no reason we can't admire and respect every individual bison, which represents a part of our natural heritage.